Alembic Club: My Baby is 40 today! Check out the profile picture to see how beautiful she is. Beautiful she is indeed Sir ! Perhaps a full polish with brass detail and lemon oil fingerboard spa treatment ? To top off the occasion , new strings ? After that there is admiration and Love ! Happy birthday AE 76-096 ! She has aged well, my friend, as has the handsome lad who owns her! Happy Birthday AE 76-096! Beautiful bass! You've kept good care of it! Thankyou for your kind wishes everyone!! 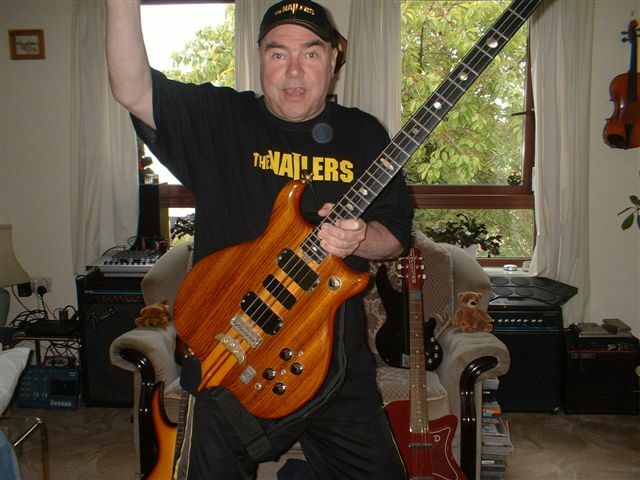 Just got to get Rusty back for posting a crap pic of my ugly mush...although it is a free publicity stunt for his great band "The Nailers"
I plgged her in after a long time using my prized 75 Precision, ..a suprb sounding bass, but now I remember why I bought the Series 1. She sounds incredible!! That's a great picture of you George! In my defense, you once asked me to post this picture for you so I thought it would be OK to use it here. It shows the beauty of your bass very well! Thanks for putting up the pic Rusty. Lets me see my baby from another angle. This bass is just sublime! !